South Fork--+Eagle Camp+--South Fork--+Iron Camp+--South Fork--Cold Gap--Trail 149--BMT Connector--+Snow Camp+--54A North--Bob Bald--Four Mile Ridge--+Naked Ground(2)+--Four Mile Ridge--+Bob Bald+--54A North--Fodderstack--+Crowder Camp+--Fodderstack--Pine Ridge and OUT. After the terrible experience with the Nammatj in a windstorm on my last trip, I decide to get a Hilleberg Staika 3-poled dome tent with the beefier 10mm poles and give it a real workout. I start Trip 55 on the South Fork trail and stop after the first major crossing at Eagle Camp for the night. 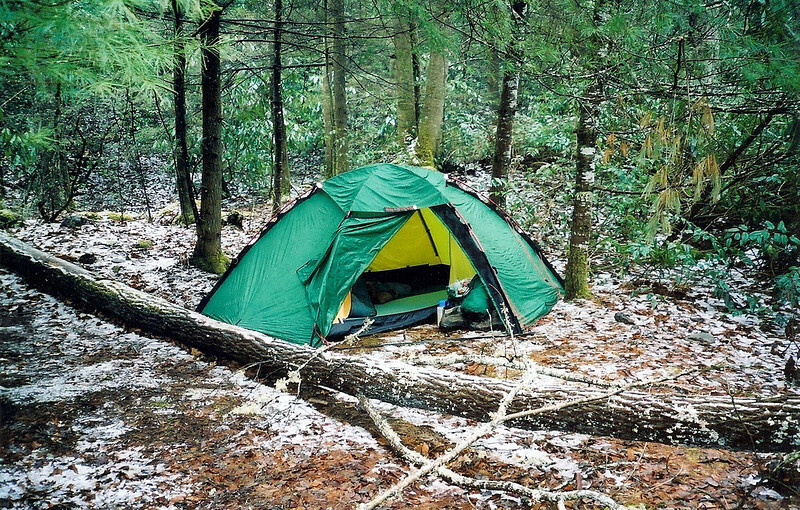 A new tent begins and celebrates the start of Trip 55 into the winter waters and coves of the Citico Wilderness. A very cold rain starts just after my arrival at Eagle Camp on the South Fork of the Citico. This would normally be a dreary, cold, wet and depressing day in the woods but carrying, setting up and using a new tent is exciting and inspiring. This trip report will also be a review of the Staika tent, a 3 poled dome beauty in green. What makes an initial good impression is its free-standing quality and consequent ability to be lifted and placed exactly where it needs to be for sleeping purposes. The 2 door vestibules are also part of the free standing dome structure and therefore do not need to be staked out. Right now I have 6 pegs in the ground, 4 to pull the tent inner body tight and 2 on the fly by the head and foot area to give a distance to the fly from the inner. As with all Hillebergs, this tent has a suspended inner tent which is supported by the 3 poles clipped ito the outside of the fly. Headroom is great and the interior space is perfect for one person. It is a big tent in some ways but in other ways its total footprint is small and fits into most tent sites. The short pole sleeves and clip system is fast and strong, a dry tent is very tight on the top clips but as the tent gets wet in the rain these loosen along with the whole fly fabrc. Day 1 ends by hanging the 3 food bags and washing up the dinner pot. A stray white and black dog named Landon has followed us from the Fields and now rambles in great circles ambling to get at the hung food while my dog offers little defiance or protection. I tried to get the bags as high as possible without resorting to using a bear rope but if Johnny B was here he'd just put them in his tent and be done with it. I am now a registered member of Whiteblaze website and have posted several paragraphs about various backpacking subjects. One of my first was an answer to the query of crossing a cold creek in the winter. I started another thread by asking a question of old gear and it generated alot of replies. Ok, night falls in the great South Fork valley so I went out to pee a final time and return to the tent to remove layers and zip up the sleeping bag and fire up a candle stub. Although the outside shape of the Staika is in a 6 sided circle, the inside living space is a long rectangle 91 inches by 56 inches. Though smaller than the Nammatj 3, it is heavier by 1.6 pounds, mostly due to the beefier pole diameter and to the addition of a third pole. Set up and take down is easier with the Staika due mostly to the clip system as the Nammatj had the trickier full length sleeves which oft times binded to each pole when packing up. The Nammatj has a better vestibule, bigger and more protective of the inner in the rain whereas the Staika's vesti is small and once opened will allow rain water to drip onto the floor of the inner. This can be managed by careful door opening adjustment on the fly, opening it just below the top umbrella fly and no more. I haven't used the bug netting or the venting options yet on either door but a second door allows pack and boot storage where they will stay out of sight until tomorrow's gear up, a nice feature. On a clear day I will set up the tent without the little umbrella sheet and try out the top 2 venting options which can be easily adjusted from inside the tent. As usual, the vesti zippers work smoothly and without the usual stress associated with vestibule zippers as it's hard to tighten this tent too taut to impede zipper action. On my Muir Trail tent I often had this problem and I had to constantly adjust fly tension because of it. Is the water of the South Fork up? No, it is lower than my last visit and though the crossing was cold I got across ok with Shunka behind. Right past is Eagle Camp so I walked to it in my red Crocs and immediately set up camp. Tomorrow I begin section 3 up to Mitten Camp, section 4 the steep climb to the cut, section 5 the briar cut and section 6 the Jeffrey Hell creekside trail up to the 2nd crossing where I'm sure there'll be snow and god forbid snowdowns(those low hanging rhododendron branches).